Today I have two of the red-toned purple polishes from the Starrily vampire inspired Welcome To Transylvania collection: True Blood and Count Dracula! Starrily True Blood is a red toned purple, light wine red with micro holo flakies. It is rather opaque in one coat, but this is two with a coat of Seche Vite. Starrily Count Dracula – if there ever was holographic blood, this could be it!! 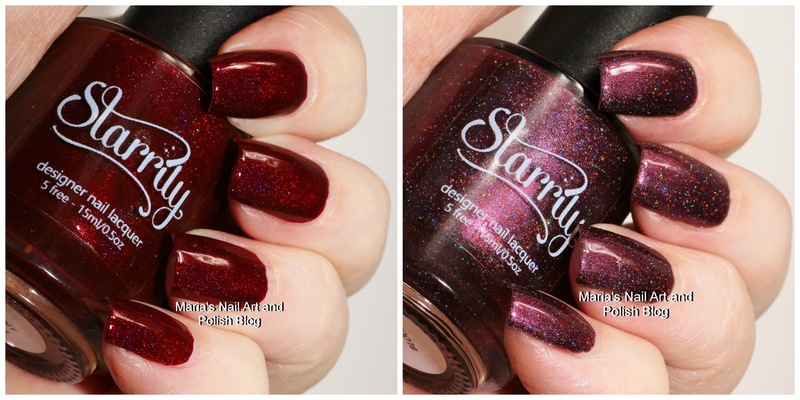 It is an amazingly vampy andgorgeous blood red, and the holo has such a gorgeous red glow. It is opaque in one coat, but this is two with a coat of Seche Vite. Did you give up on the poor videos in my post about our 3-legged foster kitten Mons?? Now I uploaded them to Youtube and used them from there - so please have another look at the improved quality right HERE - and maybe follow my "My cats" play list on Youtube! Count Dracula definitely sparked my interest. I love him - or at least the polish - so much! I see why, I hope you still can get it! Yup, so do I - super much!! I thought you would agree - my hubby also loved it! Ooh la la, they're gorgeous!